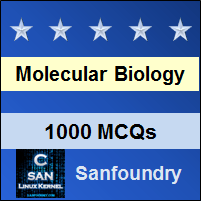 This set of Molecular Biology Multiple Choice Questions & Answers (MCQs) focuses on “Degradation of Proteins”. 1. How many types of protein degradation pathways are seen in a eukaryotic cell? Explanation: Proteins are rapidly degraded in response to specific signals, providing another mechanism for the regulation of intracellular enzyme activity. In addition, faulty or damaged proteins are recognized and rapidly degraded within cells, thereby eliminating the consequences of mistakes made during protein synthesis. In eukaryotic cells, two major pathways – the Ubiquitin-proteasome pathway and lysosomal proteolysis – mediate protein degradation. Explanation: Ubiquitin degradation mechanism recognizes both cytosolic and nuclear proteins. The major pathway of selective protein degradation in eukaryotic cells uses Ubiquitin as a marker that targets both cytosolic and nuclear proteins for rapid proteolysis. 3. Ubiquitin has ___________ of amino acids. Explanation: Ubiquitin is a 76 amino acid polypeptide. This is highly conserved in all eukaryotes (yeasts, animals and plants). 4. Ubiquitin binds to the ___________ amino acid residue for degradation. Explanation: Proteins are marked for degradation by the attachment of Ubiquitin to the amino group of the side chain of a lysine residue. Additional ubiquitins are then added to form a multiubiquitin chain. 5. The Ubiquitin-proteasome degradation pathway is an energy dependent process. Explanation: Ubiquitin-proteasome degradation pathway is an energy independent process. Thus, both the attachment of ubiquitin and the degradation of marked proteins require energy in form of ATP. 6. Which of the following is an Ubiquitin activating enzyme? Explanation: Ubiquitinization is a multistep process. In this process the first step is the activation of ubiquitin. This is done by the attachment of Ubiquitin activating enzyme, E1 to the ubiquitin. 7. The Ubiquitin-proteasome pathway is an active target for anticancer drugs. Explanation: The ubiquitin-proteasome pathway is responsible for the degradation of several important regulatory proteins, including proteins that control cell proliferation and cell survival. Since the growth of cancer cells depends on the degradation of these regulatory proteins, the proteasome has emerged as a target for anti-cancer drugs. 8. Which of the following is the substrate specific enzyme of the following? Explanation: Most cells contain a single E1 but have several E2s and al large number of E3 enzymes. Different E3s recognize different substrate proteins, and the specificity of these enzymes is what selectively targets cellular proteins for degradation by the ubiquitin-proteasome pathway. 9. The Cdk1 activates which of the following type of Ubiquitin enzymes? Explanation: Cdk1 activates an ubiquitin ligase that targets cyclin B for degradation towards the end of mitosis. The E3 enzymes are known as the ubiquitin ligases that proceeds this step. 10. Ubiquitinization always leads to the degradation of protein. Explanation: Although polyubiquitin chains usually target proteins for degradation, the addition of ubiquitin to some proteins serves other functions. For example, the addition of single ubiquitin molecules to some proteins is involved in regulation of DNA repair, transcription and endocytosis. 11. Lysosomes does not have which one of the following properties? Explanation: Lysosomes are membrane-enclosed organelles that contain an array of digestive enzymes, including several proteases. They have several roles in cell metabolism, including the digestion of extracellular proteins taken up by endocytosis as well as the turnover of cytoplasmic organelles and cytosolic proteins. Explanation: The principle pathway of uptake of cellular proteins is known as autophagy. This process involves the formation of vesicles in which small areas of cytoplasm or cytoplasmic organelles are enclosed in membranes derived from the ER or mitochondria.